This trio of early e-poems were written in HTML and use Java applets to shape their linguistic texts with a careful touch. 'Infinity' and 'Internet Junkie' both change the colour of the text over a schedule to shape readings and to imbue them with a nervous energy. 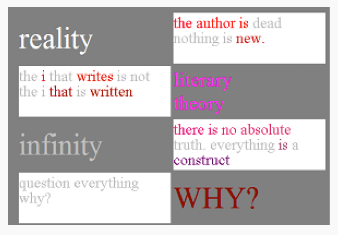 In 'Infinity' (displayed above) the rarely used tag reinforces the instability of textual meaning as the phrases can be read with and without the three blinking words, 'reality,' 'literary,' and 'Why?' In 'Internet Junkie' the increased rate of colour change from one stanza to the next mimics the increasing urgency of the addict's need. The final poem in the piece uses the 'NervousText' applet by Daniel Wyszynski to animate its words, 'KOMNINOS is a poet,' which can be soothed into static stability with a mouse click. 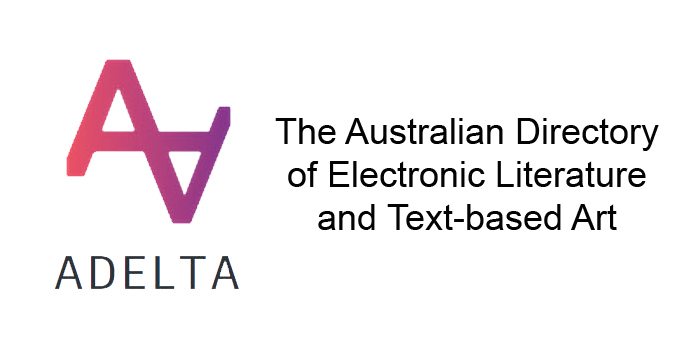 Zervos, Komninos, “Java Poems,” ADELTA, accessed April 22, 2019, http://adelta.westernsydney.edu.au/items/show/253.